Tom Cappaert has played with the Kishwaukee Symphony Orchestra for two years. He is principal cello but in the past has also been spotted in the second violin section. 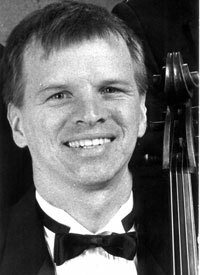 Tom is currently working on his Performer’s Certificate in Cello with Marc Johnson of Northern Illinois University, and is an orchestra director for the Indian Prairie Schools in Naperville. Tom is a tireless advocate of string music education for youth and is an avid chamber music player. For the fourth time Tom and his friend, Ray Ostwald, traveled to the small town of Chiquimula, Guatemala, delivering string instruments to a new orchestra program. He has also toured the mountain towns of Guatemala playing his own fiddle tunes. He has appeared with the DuPage Symphony as Santa Claus and with the Southwest Michigan Symphony as the Pink Panther. His first CD of cello meditation hits appeared in 2006, as a fundraiser for a mission trip for the Randy Stubbs family of DeKalb to travel to Tanzania. He has been principal cello and resident quartet member of the Canton Symphony (Ohio), the Ann Arbor Symphony (Michigan), and the National Symphony of Ecuador. He has appeared as soloist in Michigan and in DeKalb, performing the C.P.E. Bach Cello Concerto in A Major. Tom really enjoys playing with the KSO!